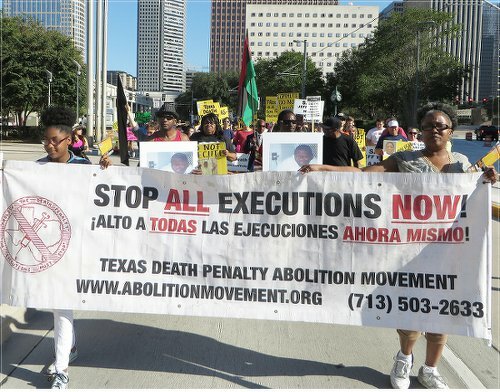 Houston — The 15th annual march in Houston to abolish the death penalty brought together 200 people on Oct. 25. The families and friends of loved ones on Texas death row, which has the highest number of inmates of any state in the U.S., were joined by political activists, many of them young, from around the state. Harris County, where Houston is located, sends more people to death row than any other U.S. county. Harris County also sends more people to death row than any state except Texas. The protest was organized by the Texas Death Penalty Abolition Movement. The protesters gathered at the infamous 400-year “Old Hanging Tree” in Tranquility Park, where speakers made the links between the lynchings of Black people during slavery and Jim Crow and today when executions of mainly Black and Brown people take place in the death house in Huntsville, Texas. The march was followed by an outdoor rally at the Multicultural Education and Counseling through the Arts center. Numerous signs showed the faces and names of those on death row, some of whom are facing execution dates as soon as Oct. 29. Many signs featured Texas Gov. Rick Perry, with “serial killer” written under his name and headshots of the hundreds of prisoners who have been executed under his watch. Activists called for the abolishment of the death penalty as a cruel weapon targeting the poor, people of color and those who have legally proved their innocence. Endorsers of the march included S.H.A.P.E. 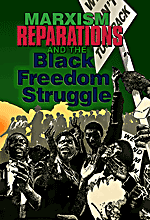 (Self-Help for African People through Education) Community Center, Houston Anarchist Black Cross; death row exoneree Clarence Brandley; Campaign to End the Death Penalty, Austin; Minister Robert Muhammad, Nation of Islam; Workers World Party, Houston; Kids Against the Death Penalty; End Mass Incarceration, Houston; New Black Panther Party, Houston; and Texas Moratorium Network. Pam Africa, a leader of International Concerned Family and Friends of Mumia Abu-Jamal, was the keynote speaker.